Winemaker/owner/bottler/ Michael Simons, invites you to a private tasting in his private cellar in the Monterey hills. 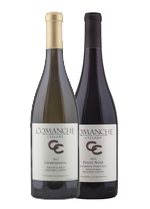 You’ll enjoy a relaxed and fun guided excursion through the winegrowing process, as you learn about all the great vineyards where Comanche Cellars wines begin. Per person tasting fee, with cheese parings, $10. Please contact 831-320-7062 to arrange your cellar session! “Flirty Filly” Twin-pack: You get two bottles of our 2011 Chardonnay, Arroyo Seco,bodaciously fruit-driven, frisky and bright as the full moon. Normally $30/bottle, now 25% off on a two-pack. You pay just $45, plus tax & shipping. 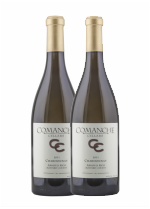 “Burgundy Beauties” Twin-Pack: You get one bottle of 2011 Chardonnay and one bottle of 2011 SLH Pinot, normally $34/bottle, also, 25% off! This Pinot is a thoroughbred of a wine: handsome, elegant, smooth and stylish of gait. Two-pack, for just $48, plus tax & shipping. Take an additional 10% off 3 or more bottles! And 15% off 6 or more! 2009 Cabernet Franc – big, brazen and filled with heady spice. 2009 Syrah – from Mission Ranch Vineyard, well-structured, smoky and sensational.